Most of what can be seen on surface dates back to the successful re working of the mine between 1907 - 1914. 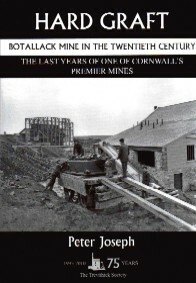 In this volume Peter Jospeh has researched and put together the previously unpublished details of the final phase of this famous mine . There are maps descriptions and phtographs which will enable the visitor and historian to make sense of the site. The pioneering conservation of the Crowns Engine houses is also told in detail. What I do like about the book are the excellent maps showing locations of the mine and associated works.